I need help with repair! By Col. Edmund Lauder, a SLP and laryngectomee. Covers a wide range of material on adjustment and rehabilitation, speech methods and exercises, support groups and more. Also includes ads which are valuable reference to many useful products. Available as hard copy or as a downloadable PDF. 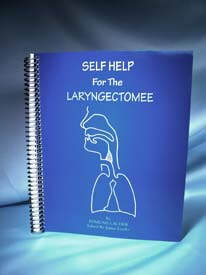 Has been a major and trusted reference for speech pathologists for many years. 175 pages, soft cover, spiral bound, published by Lauder Enterprises. The iVox, a new artificial larynx designed for easy use. Unique Tone Variation - Automatic tone variation helps eliminate both unnatural tone swings and flat monotone voices. Easy adjustments - All tone and volume adjustments are made from one external thumb-wheel, eliminating the need for disassembly, special tools or complicated instructions. Light indicator - Interactive lights lets you know when the iVox is ready to go, when you are in adjustment mode or when the battery is getting low. Flexible power - The iVox can be used with a standard 9V battery or 9V rechargeable batteries. Weight: Less than 5 oz. 2-year limited warranty with accidental damage protection. Comes in complete kit including electrolarynx, charger, rechargeable batteries and oral adapter. Take me to the Electrolarynx section! - offer excellent protection against dust, dirt and pollen, while helping warm and moisten the air you breathe. - Breathe easy through soft, free-flowing foam that offers virtually no resistance, while helping warm and moisten the air you breathe. - Designed for single use, with a hypoallergenic non-irritating self-adhesive strip that's comfortable and easy to apply. - Not recommended for cannula users. - Day or night, you'll breathe easier! Thanks for stopping by - We Have Ways of Making You Talk!